There is a lot going on with SpaceX right now, with their Grasshopper effort, the Falcon launches and attempts at booster returns, the Falcon Heavy development, and the Dragon (both crew and cargo) successes and developments. With all this I thought I might start a new thread that could cover the news on these events and the on going efforts by SpaceX. Space X just completed the first test of their Crew Dragon capsules emergency launch abort system. This one lifted directly off from a launch pad. They are reviewing data etc to confirm whether it met spec'd criteria and was truly successful. The next test of the system will be a full lift-off test during peak acceleration/speed/atmosphere. Acceleration was a little lower than they wanted because of an improper fuel mix ratio, but within acceptable range. Since Dragon wouldn't have to escape solid booster or hydrogen explosions, it doesn't need ludicrous acceleration like Orion. Any pix of what's left of the trunk. I imagine they had to send divers after it. I've been looking and haven't seen anything in the public spaces but I did find several other discussions on the topic. Makes my brain begin to hurt with the densities being achieved by some of the posters (i.e. : they are dense, sooo dense...) . Many do not understand what "test" and "data" means and what it allows, as in "With data you can then calculate things such as worst case scenarios that you really wouldn't want to test in a real world situation without understanding the possible consequences... " Sigh. And I thought WE here were dense (with a few smarticle ones that tell us when we are being stupid )! On board video from Dragon 2 pad abort test. Used to be, you had a film camera, and it needed extensive case work to create a waterproof enclosure for both camera and power supply. Today .. you just glue a GoPro onto the side. done. Cool Video. Didn't look too bad from those cameras. I was struck by the apparent condition of the parachute lines. Looks like they had been through a few test flights. This clears the way for SpaceX to bid on US DoD contracts for satellite launches. Congrats to the SpaceX team for this. It comes with an asterisk -- that asterisk is that SpaceX can only bid on 1/3rd of the launches until Falcon Heavy is operational. Not exactly true. SpaceX has some upgrades in the pipeline that wouldn't require major recertification like the M1D did, that will allow them to handle closer to 2/3 of AF payloads. The biggest thing about the FH might not be increased payload as much as 3 core reuse out of the box enabling ludicrously low pricing. An FH can get all 3 cores back would cost less than an expendable F9 in time. So the next Falcon launch is coming up with the first window on the 28th. Hope all goes well. I have been checking out the ASDS to see when it moves out of port. It doesn't appear they have transponders on them but the tugs and the SpaceX service ship "GO Quest" do, so I am watching them. They are currently still in port in Jacksonville FL. I am guessing they will head out tomorrow but it could be Saturday. Basically there are 3 ASDS currently but only two may be active as the first ("Just Read the Instructions") may be retired. Its extensions were apparently clipped for use on a new ASDS that is currently making its way to the west coast via the Panama Canal (though I do not know if her name is being retired). I am wondering where on the west coast they will weld the extensions on to the new ASDS. San Diego seems to be an obvious choice and I am hoping we will see her here in the near future. But I don't know. I am tracking the tugs, the Elsbeth which is tending "Of Course I Still Love You" on the east coast and the Rhea (currently off the coast of Guatemala) and the GO Quest as well. Crazy awesome video was just released of the last booster recovery attempt in April. Its what we've seen before but more. Specifically the early part where it is screaming down into the atmosphere on its ballistic trajectory heading for the ASDS landing platform. You don't see it for long and you don't see the high atmosphere burns and guidance inputs that must have occurred to get it so accurately aimed, but it is long enough for you to realize just what a feat it is they are accomplishing/trying to accomplish. Honestly to be getting as close as they are as quickly as they are is impressive. Man, I love their ship names! Awesome is right! Whole new level of respect for what these guys are trying and what they've accomplished so far. The Elsbeth and the GO Quest have departed the port of Jacksonville and are both under way in the same location, heading in the the same direction. That should mean "Of Course I Still Love You" is in tow and on its way to the landing location! about 10 seconds before landing, a valve controlling the rocket’s engine power (thrust) temporarily stopped responding to commands as quickly as it should have. As a result, it throttled down a few seconds later than commanded, and—with the rocket weighing about 67,000 lbs and traveling nearly 200 mph at this point—a few seconds can be a very long time. With the throttle essentially stuck on “high” and the engine firing longer than it was supposed to, the vehicle temporarily lost control and was unable to recover in time for landing, eventually tipping over. Post-launch analysis has confirmed the throttle valve as the sole cause of this hard landing. The team has made changes to help prevent, and be able to rapidly recover from, similar issues for the next attempt, which will be on our next launch—the eighth Falcon 9 and Dragon cargo mission to the space station, currently scheduled for this Sunday. Even given everything we’ve learned, the odds of succeeding on our third attempt to land on a drone ship (a new one named “Of Course I Still Love You”) are uncertain, but tune in here this Sunday as we try to get one step closer toward a fully and rapidly reusable rocket. I doubt it, I'm sure I am reading something in that isn't there but I'll keep my fingers crossed. 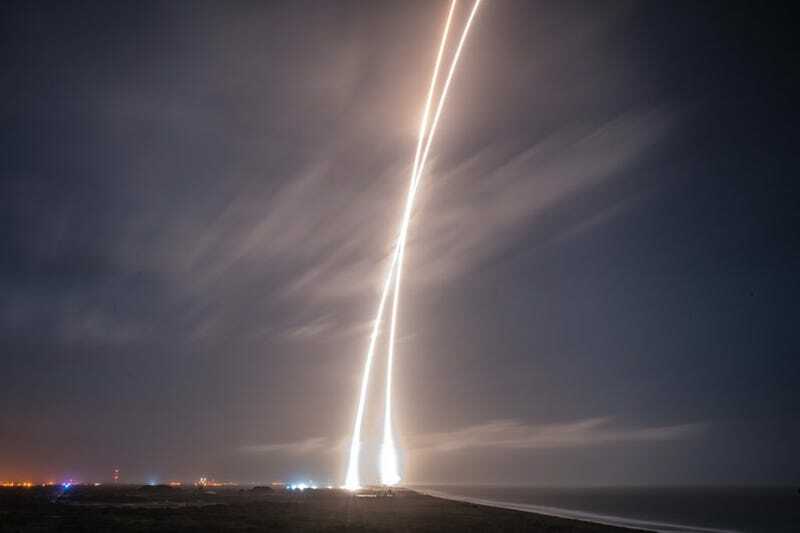 The Falcon 9 booster landing last night is about one of the coolest things I've seen done in the space yet! Congrats SpaceX! That was definitely a thing of beauty! X marks the spot... They can't have been more than a few feet off the target. That was a good read. I see alot of similarities at the company I work for. As the economy turned for the worse, the company went from a lumbering giant to a slimmed down agile rabbit, able to do things in a non-traditional manner, cheaper and better. I was bored working before, but now im allowed to do things in creative ways, work hands on with our trades... it makes things work so much better. Id love to meet Elon one day, he is quite an inspiring person, probably the forefather of the google of space. He wants to better the world, and if that means doing something that seems crazy... it just means they have first shot at it. He is refreshingly light hearted about serious stuff, like when they lost the Falcon 9 over the summer. "Rockets are tricky...". It sucked, but sh!t happens and getting worked up isnt going to fix it, so you might as well use a bit of humor. I was a bit offended when Jeff Bezos tweeted to SpaceX about joining the club of landing rockets... SpaceX was doing it with Grasshopper for a few years, and was getting really close with full size rockets, and Bezos thinks he won some race with his cute stub of an amusement ride! Grrrrrrr. It also sounds like they're planning to take the landed booster, refuel it, and do a full length test burn at the LC-39A pad. All held down of course. And no damage found on the booster. Don't know how in depth they were. Sounds intriguing, wonder if there is some proprietary processes that SX don't want revealed just now. Would be great to see though. Thanks for the HU. Any idea how many of the next few missions have the capability (fuel reserves, trajectory etc.) to permit more of these return flights. I'm also wondering if the legs are made for the return missions specifically at this early stage eventually being used for all or do they have a stock of non-landing leg fitted boosters. All boosters come with legs now, although they are pretty easy to remove. Thanks for that travelavnut, much appreciated. Something about Mars maybe ??? A new video has popped up, it is not the one we all here really want (a booster-eye view of its return) but it is nice (over-produced: SUPER-EXCITING with cool "success" music and everything!). Go to the 2:35 mark for some new cool views of the landing. SpaceX hopes to make history again on Jan. 17 by landing a Falcon 9 rocket on a drone ship at sea after launching a payload into orbit. SpaceX confirmed to NBC News that it would be making the attempt; the news was earlier reported by space journalist Charles Lurio on Twitter. This launch will take off from Vandenberg Air Force Base in California, carrying NASA's Jason-3 satellite. Jason-3 carries instruments to monitor the ocean's surface, collecting information about circulation patterns and perhaps rising sea levels. SpaceX will be launching Jason-3, an oceanography research satellite, on a v1.1 Falcon 9 from Vandenberg this afternoon at 1342 EST, about two hours from now. An attempt will be made to land the first stage on an Autonomous Spaceport Drone Ship (ASDS) immediately following launch. Coverage available from NASA TV and at SpaceX.com. And just for ease here are the links. Space.com/NASA has video and audio already but the SpaceX "show" starts an hour before launch. Well they are not active yet. I had read earlier in the week they would start an hour ahead of the launch but no joy so far. I'm going to recheck what I saw. A little blue is starting to show through! "First stage on target at droneship but looks like a hard landing; broke landing leg. Primary mission remains nominal"
Landing with thrust so much greater than weight must make it hard to hit a target that's bobbing up and down. You have to hit zero velocity at the exact right place to avoid coming down too hard. I always thought they should spring for a semi submersible, but they'd be harder to move around. I always thought they should spring for a semi submersible, but they'd be harder to move around. Do they really need to be moved around though? Assuming SpaceX is going to be launching from a handful of pre-determined locations — Vandenberg, Kennedy, X, Y, Z — might it not be smarter to to just put an oil-rig type stable(-ish) platform downrange? Landings can be planned based on payoads, with the lighter missions doing a full RTB and the heavier ones dropping onto the platform to be retreived later. The issue with that is that with a movable platform you have a much greater potential scope for heavy burns than you do with a fixed platform - need more payload thrust (longer first stage burn) but also a first stage landing? Means either more fuel overall, which is a diminishing return, or move the landing platform further down range so the first stage doesnt have such a great return-to-base burn, meaning less fuel needed. Wind issues to deal with on the return burn? A fixed platform means more fuel needed to burn, while a movable platform means you can take advantage of that wind. Etc etc etc. And it looks like it wasn't the motion that was the problem at all, but the fact that one of the legs didn't lock. Musk says a landing on shore would've probably failed too. Musk tweets: "Well, at least the parts were bigger this time! Won't be last RUD, but am optimistic about upcoming ship landing." Biggest benefit, I suspect, of a movable landing platform is the ability to offer a range of launch azimuths. With oil at $30 a barrel maybe Musk could pickup a couple of semisubmersible oil drilling platforms cheap? Speaking of which what is SeaLaunch's platform doing these days? The problem might already be solved. Beefing up the leg design was part of the F9 FT project. They're speculating ice buildup on the locking collet from the heavy fog at launch. If the only problem they had was a small landing gear snag which is apparently an easy fix, then this was very close to another success. However, that's the second time they seem to miss on a good landing for a relatively minor detail which was known and easy to fix. If anything, it does show that, as with every space endeavor, it only takes a tiny thing to go wrong for the whole thing to come crashing down. I've seen suggestions that this was another possible issue already fixed on current boosters with the collet being beefed up. Pretty sure this was the last non Full Thrust booster to fly. Similar to the first landing attempt where it ran out of hydraulic oil but the later boosters already had a bigger reservoir. Quite a good landing actually. On target and though they say it was "hard" it looked about right.